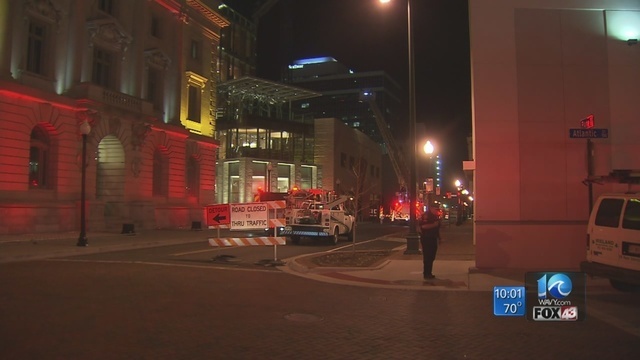 NORFOLK, Va. (WAVY) -- Norfolk police and firefighters responded to Selden's Arcade, after a partial building collapse Friday night. Battalion Chief Julian Williamson said the collapse happened around 8:15 p.m. in the East Plume Street side of the high-rise building. There were no reported injures. Williamson said the initial report was that there was no one inside the building at the time of the collapse. Crews were conducting a search to make sure. Williamson said there was significant structural and internal damage to the building. The official cause of the collapse is unknown, but the initial report from police and fire crews is that an electrical issue may have caused an explosion. 10 On Your Side spoke with a demolition expert at the scene. He did not want to go on camera, but said his 20 years of experience have taught him that explosions like this happen more than you might think. He said he saw shorted out electric wires underneath the sidewalk in front of the Arcade. He said, if that is the case, then all the wires in the building could have heated up, causing the plastic around them to release a flammable gas. A single spark may have caused the gas to explode. An explosion, he said, would be enough to blow out windows and walls. That's not officially the reason for the explosion. The city of Norfolk has not released a cause yet. Virginia Natural Gas and Dominion Virginia Power secured utilities to the building Friday night.